~ When your boyfriend tells you to get used to luxury, please do. It will prevent your jaws from dropping every time he buys you something or takes you out somewhere. And lets face it, not many guys tell this. ~ Valentines day is super hyped. We did go out and celebrate, but it just felt like any other day. But yeah, we cherished the togetherness more. ~ Why is everyone around getting married, engaged or having babies? Seriously people, the world is NOT gonna end in 2012. ~ This blogger called phatichar has got me addicted to his blogs. He's a fiction genius. I don't believe in ghosts, but he has successfully managed to convert me. ~ Totally, overtly grateful to RIM (Research In Motion). My blackberry is the best thing to have happened to me after love. ~ My greed for meat continues. And I find it surprisingly funny as to how I have moved on from one brahmin boyfriend to another. ~ I cut like about 6 inches of my hair and did not cringe even one bit. Sigh, the art of growing up! ~ I watched 'Ek main aur ekk tu' and liked it. People are talking as to what a bore the movie was, but the concept of a Hindi movie with a surprising climax, well, surprised me. ~ I'm travelling again on the 3rd of March. Back to Accra for two weeks and then straight to Colombo for another two. Looking forward to it. Heard Sri Lanka is a beautiful place. ~ The change in my relationship status on FB triggered more speculation and controversy than Vidya Balan's dressing sense. ~ Looking forward to the Oscars 2012. Fingers crossed for George Clooney. 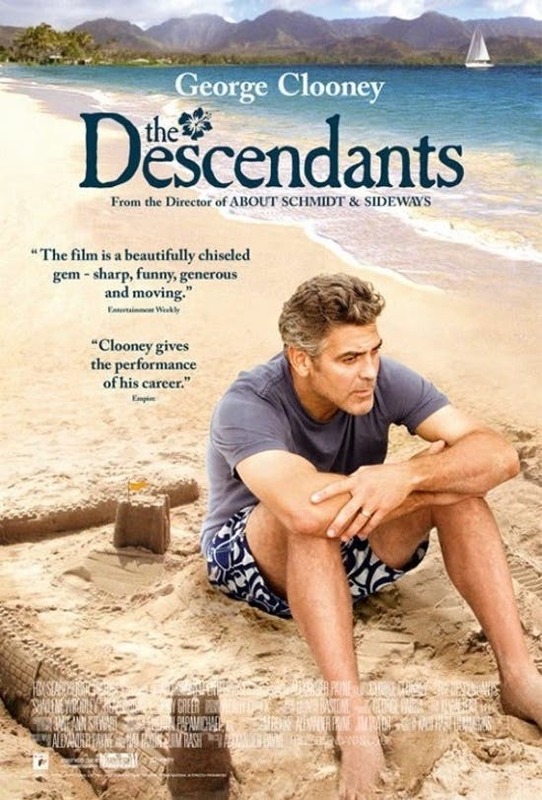 Having said that, I haven't seen 'The Descendants' yet. Anyone has? Feedback? ~ Have developed an aversion towards alcohol. I almost puked on my guy after I smelt wine in his breath. Ditto with smoking. But addiction is not letting me go easy. ~ A blog post needs to define who you are or should be about something that is important to you. It annoys me to the core when people decide to write about national proceedings and get all the facts distorted and wrong. Kudos to Chintuji for getting it perfectly right. All the time. The others, please don't write just for the sake of it. ~ One more thing most annoying about bloggers these days is about commenting. I mean, come, read and if you feel like saying something, comment. If you like the flow of the blog, follow. Isn't it that simple? No expectations, no demands. Like PeeVee says in her comment header, if you just want me to visit your blog, skip the comment and mail me the link. Its not a competition and definitely not a publicity gimmick. Comment and follow at your own will. ~ People these days constantly ask me as to if I have thought it through before getting into this relationship. And more often than not males. Lets face it dude, I did not fall for you then, it sure ain't gonna happen now. I've made my choice. Let me be. ~ I got bored of sleek formals, so trying my hand at kurtis with chudidaars or patiyalas. So far, so good. Also realised I have dust allergy as I was digging out my kurtis from the farthest unused corner of my ward robe. ~ My shoe collection crossed 80 pairs! Eagerly awaiting the century. ~ The tiny glimpse of winter in Bangalore was more then compensated by the 3 days that I spent in Kodai. The genius who came with me told me to carry just one jacket and the rest of my luggage consisted only of short shorts. Imagine the plight! ~ I'm writing a new post after so long, that I had almost forgotten how to do it. OMG I dont know what to comment :P..its like I have something to say on each point..but... hey brahmin bf for a meat lover..gosh that's interesting! have a plan to start a shop? I cut my hair in 2009! Still, growing....reached shoulder length finally. Sometimes, a drastic hair cut helps ward off negative energy. I had gone for a crop cut that too from long hair, so, I am sure this is a new beginning. And I too feel that I have forgotten how to blog. Meat? Ugh I feel sick the first week after the wedding since all I got to eat in Kerala was meat and rice! :/ I am not pro either of those! :P LOL! i love to ramble like this. hmm...yeah...each point evokes some response from within you know..
hmm...relationship...our lives revolve around them no..
i know how it feels..to answer the gazillion queries from ppl on your decisions..
aaarrgghh...at times a feel like yelling out loud..
i hope i will be able to kick this state of ennui outta my mind. That is something I am more than just jealous of!!!! and about changing the relationship status of fb...PEOPLE JUST CANNOT MIND THR OWN BUSINESS! well, good recipe for a interesting sort post. P.s I might have forgotten what it is to write. Entirely. I'm sucha I-don't-keep-junk typo person and whenever I buy something new I get rid of the old ones even if I have worn 'em like just once. Travelling again? Lucky you ! :D Please please take me with you. I am also smart. I swear ! Here for the first time and will be staying for very very long. God, you forgot how to write and you wrote so well!! 80 pairs of shoes!!! whoaaa!! Exactly! People I hardly talk too starting calling and messaging me like I had to consult them before that. Idiots! Seriously. Some people just comment on blogs to get followers! Thanks dear, I'll try to post more often. Just that travelling and work keeping me really busy. Squeeze out time na love, miss your posts! Oh tell me about it!! Awww I'm glad I could make you smile. And why sad? All ok? Ah ha, so did you get the essence? No storm, I've made my peace with silence now. What ever works for you my lady. Naah, private property of Soumya Prasad only.